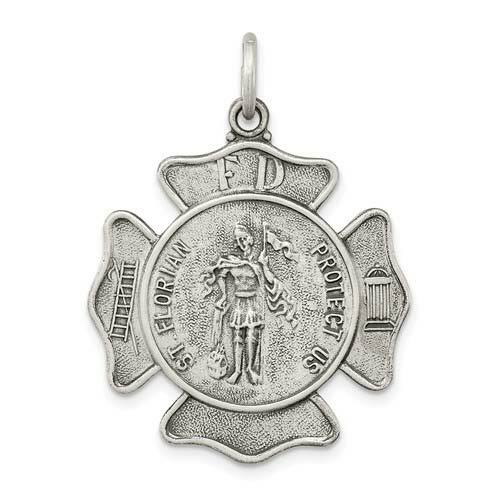 This Saint Florian medal is the perfect gift for the fire fighter in your life. Solid sterling silver. Satin and antique finish. Weight: 4.26 grams. Measures 15/16 inch tall by 15/16 inch wide without bail. This item is slightly smaller than a quarter. Engravable on back. Made in the USA. It was a relief to get this gift as it has always brought me luck in my career as a firefighter. Its good to have it back on! I was okay with it but the link at the top was so small I had to add another link so the chain I bought would fit through it. Fast service, engraving was done well but not overly impressed with quality. This was an anniversary gift for my boyfriend who is a firefighter. What was great about this pendant was that is it was engrave able so that I could personalize it!